Vanilla is one of the most expensive spices after saffron. It is a ubiquitous flavour in many sweet dishes – ice cream, custard – and yet under valued in savoury ones. So this post is hopefully going part of the way to address that and demystify the savoury uses of this delectable and exotic spice. It has a soft, sweet aroma and flavour which pairs so well with desserts and cakes. Vanilla also holds a very special place in my heart as the vast majority of it comes from Madagascar where I spent a year as a child and on a return trip 20 years later, I met my future husband. From that trip I brought back half a kilo of the valuable beans, smuggled inside a smelly sleeping bag as the export limit was so tiny. I only have half a dozen of those beans left sadly; a good excuse to go back. But these days real vanilla is easily available. Please never use the ‘essence’, but a good quality extract is essential in baking. Vanilla beans are actually the pods of a climbing orchid native to Central America, though 75% of the world production is now in Madagascar. Vanilla growing is a labour intensive and slow process; the flowers must be pollinated by hand, the green pods must be harvested by hand and cured in the sun over several days, raised to high temperatures and ‘sweated’ in cloth to achieve the complex balance of sugars and aromatics, then dried and straightened out for several weeks. Look for fragrant, very dark brown, almost black pods that are slightly wrinkled, but still supple, with a slightly oily, shiny surface. Length is an indication of quality – 15-20 centimetres is best. If there are white fibre like crystals on the surface of the pods, this is a sign of extra quality. 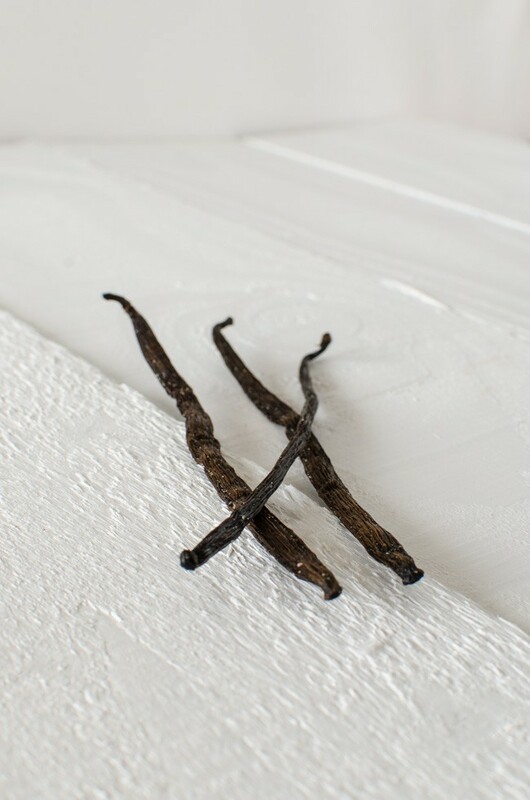 Store vanilla pods in an airtight container in a cool dark cupboard and it will still be good after a few years. Prepare the pods by splitting down the length, opening out the inside of the pod where the seeds are and using the back of the knife to scrape down the length. Add the seeds and pod for flavouring. 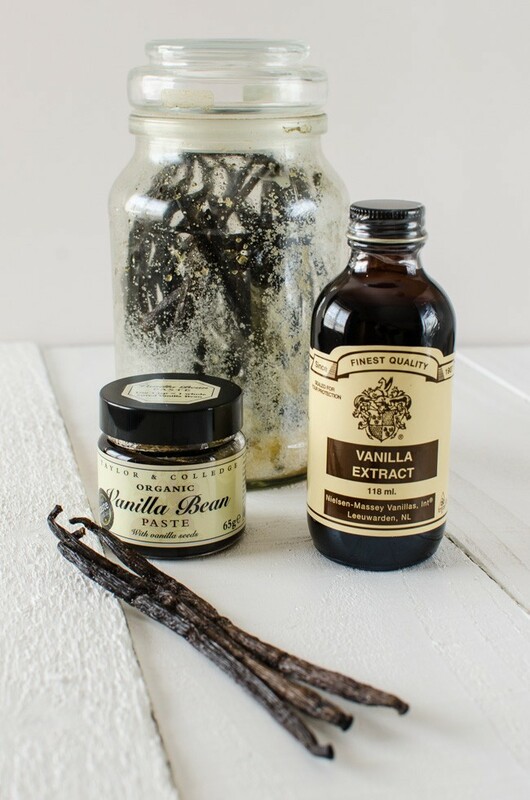 You can reuse the pods by rinsing well after infusing the milk or cream base and leave to dry for a few days; add the dried pod to a jar of sugar for homemade vanilla sugar. I store my pods in a jar with a little sugar in the bottom; whenever I open the jar, I have to stick my nose right in and take a deep breath. We ate versions of this dish nearly every day on our trip around Northern Madagascar. I have upped the spice a little and although it is the main vanilla growing region in the world, I don’t think any versions we had in Madagascar actually had vanilla in it. Missing a trick. Vanilla also goes well with seafood and a typical dish would be lobster or prawns with a vanilla sauce. Heat the oil in a heavy bottomed pan and when hot fry the chicken until brown on all sides. When done remove from the pan and rest on a plate. Fry the onion, garlic, ginger and chopped chili with a teaspoon of salt until translucent and soft. Add some chili powder to taste (depends how hot you like it and how hot your chili powder is) and stir for a minute. 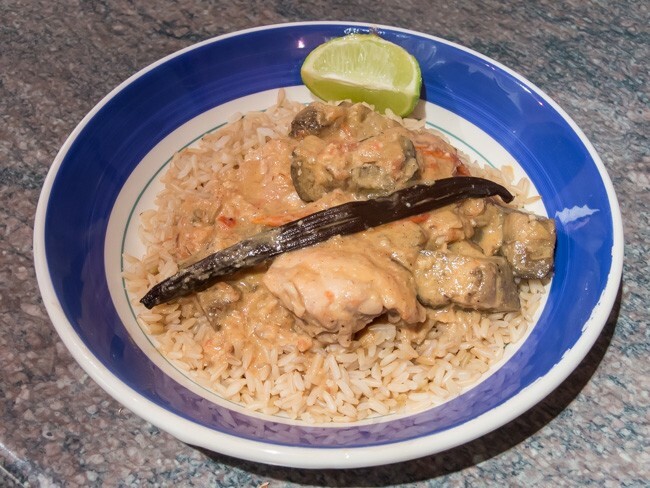 Put the chicken back into the pan with the onion mixture and add the coconut milk, grated coconut and tomatoes. Split the vanilla bean length ways and scrape out the seeds, adding the seeds and remains of the bean to the pan. Give everything a good stir; top up with water if necessary so that the chicken is just covered. Put a lid on the pan, bring to a simmer and cook for 30 minutes. Remove the lid and taste; adjust seasoning as required. Cook for another 10 minutes with the lid off. Serve over white rice with a wedge of lime.